Windows is always the most virus-affected operating system, and so the malicious stuff usually keeps attacking the files and the computer when you are browsing some risky sites, and don’t have any good protection tools activated. The Microsoft Windows Malicious Software Removal Tool checks computers running Windows Vista, Windows XP, Windows 2000, and Windows Server 2003 for infections by specific, prevalent malicious software—including Blaster, Sasser, and Mydoom—and helps remove any infection found. This tool is updated every month with the security measures taken against other new security breaking incidents, and this update is usually available through the Microsoft Update, Windows Update and the Microsoft Download Center. 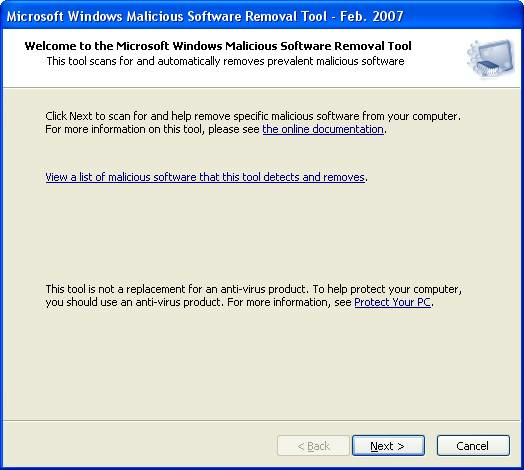 This tool helps in cleaning many malicious software and is an official trusted tool by Microsoft. It scans and provides a report on which of malicious softwares were found risky and which were removed. Download the Microsoft Windows Malicious Software Removal Tool from here. A good tool to remove the malicious software, and that working with all the version of the Windows OS gives us a good choice. the post is really nice, and the features of this software is really good. already downloaded this one and used it was really helpful for this information and the link.